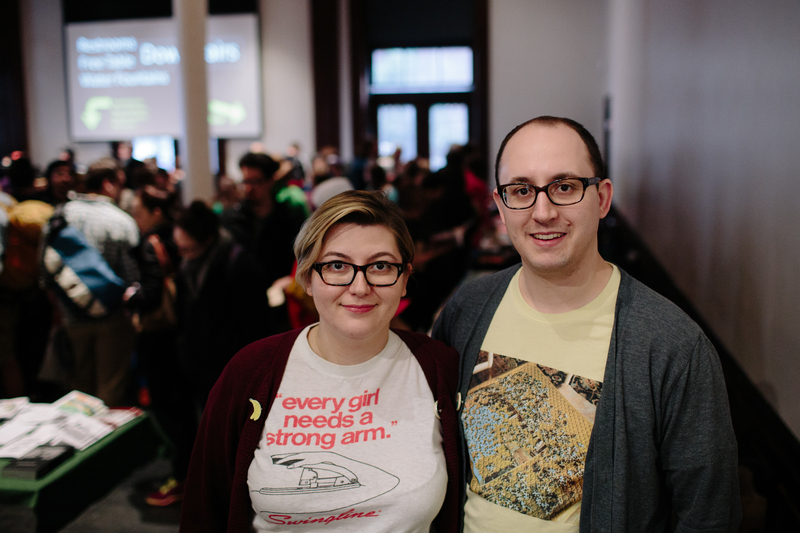 The Brooklyn Zine Fest is organized by founders Matt Carman and Kseniya Yarosh (seen here at BZF 2015 in a photo by Sylvie Rosokoff), editors of the collaborative film zine I Love Bad Movies and other publications. Postcard printing assistance provided by the carbon based mistake. Photography of BZF 2014 and 2015 by Sylvie Rosokoff. Zine fest playlist curated by the incomparable Rachel Kowal. Thank you to Stanley Sakai (a.k.a. the Stanographer) for his stenography and CART services during our 2014 and 2015 panel talks. Many thanks to the staff and volunteers at Brooklyn Historical Society who help us throughout the weekend, and to our 2015 volunteers Tom, Samara, Larry, and Joel, all of whom helped immensely with getting this event up and running each day. The Brooklyn Zine Fest is a space for creative, independent, talented voices from New York City and beyond to connect with an engaged audience. Our exhibitors create all kinds of zines to showcase their writing, illustration, photography, interviews, and any & everything else they’d like to share with the world. Celebrating its 150th anniversary, Brooklyn Historical Society (128 Pierrepont Street in Brooklyn Heights) recently underwent a building-wide, historically conscious restoration, modernizing the space while retaining the building’s original architectural details. For more Brooklyn-based programming and information about BHS’ events and exhibits, see brooklynhistory.org. You can also find us on Facebook and Twitter, but mostly on paper. According to BHS' official count, this year's fest brought 3,548 zine fest attendees who browsed self-published magazines and chatted with their makers throughout the weekend. The fourth annual event featured more than 150 writers, artists, & publishers from the five boroughs and beyond, including a Student Section showcasing the next generation of zine makers. Each day featured a completely different lineup of Exhibitors, in order to showcase as many zine makers as possible. See Photos from this and past years, read recaps & reflections on the Press page, or browse zines, tablers, and full event details from all BZFs in our Vault. To join our mailing list, enter your e-mail address here.